Wow! Someone read the ebook! And gave it 5 stars! Thank you whoever bought, read and reviewed the ebook! You are a peach! Now Jesus had healed my broken heart and fixed me up just fine. Or, rather, He healed my broken heart and is fixing me up just fine. It’s an ongoing thing. We still meet every day. And of course we walk together every moment of every day. And every now and then He does another little tweak inside me. Get me the baby I wanted. Get me a better job or the respect of my old job back. Make my husband want a baby with me or consider adoption. Make my husband desire me more sexually. Get me a car with a great stereo and a home by the sea. So I am still the loser I was. Except everything is different! I am not a desperate loser who looks at the next 40 years with dread because there is no point to living! I am a happy loser with a song in my heart who shares every moment with the One who knows me fully, loves me completely, and every moment is transforming me into the image of Himself, or I would say, into the very substance of Himself, which is love. LOVE, LOVE, LOVE! This is what you discover in God’s grace poured out on you. God is Love. He loves YOU. He’s not mad at you! He’s not punishing you! He never dreams of punishing you. He was and is willing to give up everything just to be with you. Oh my goodness! 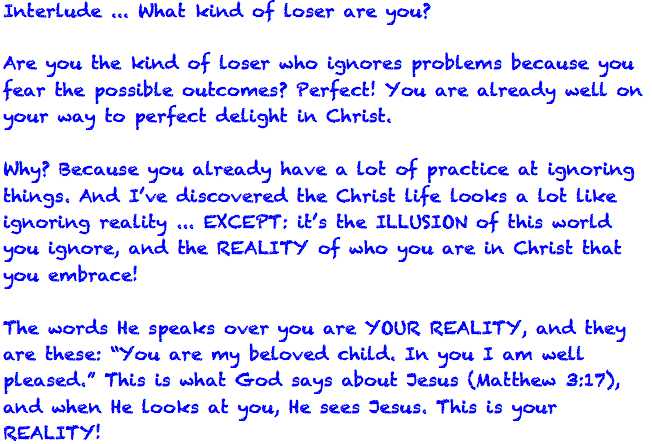 If you really experience this, directly from Christ Himself, you cannot stay a sad and broken-hearted loser. I know it sounds stupid. If what you want is a cool car, a great house, a good-looking mate … and what I offer you is the intimate knowledge of God’s love … well, you can’t eat it or show it off or sell it for something better. I mean, it’s nice, but what good is it, right? That’s exactly why this is so difficult to explain to someone who is not experiencing it. It sounds like it’s all ethereal and spiritual and nothing you can touch and hold in the here and now. But it isn’t! This love, this experience of God’s love, it turns out, is more REAL, more SOLID, more ENDURING than any mere car, house, lover or bankbook. In fact, it freaking liberates you from longing for the car, the house, the lover, the bankbook. It sets you free to live like a king no matter what your circumstances. This is why the Apostle Paul could say that he knew how to live in plenty or in want (Philippians 4:12) … because when you are experiencing the intimate love of Christ, you have, already, everything you need. Back to the question: What good is this intimate experience of the love of Christ if it doesn’t get you what you want? Here’s the thing: it does get you what you want. Because the more you experience Him, the more you realize, Jesus is what you want. He becomes your passion. And He is willing to give Himself abundantly to you. You don’t get all the cool stuff you want right now— you get something so much better, it’s not hardly even possible to explain the distance between them. Far too easily pleased! Yes! If you would choose a cool car, a hot spouse and a great house over infinite joy, then you really are a loser. Just kidding. But I don’t want you to think that apprehending the joy of intimate relationship with Jesus is necessarily going to get you a lot of material blessings. It will get you something so much better and beyond material blessings, your whole perspective will be transformed, and your life will feel like it’s beginning again. I am happy to tell you: no and no. The grace is there, for you, for me, for everyone, whether we accept it or not. If you don’t accept it, you will be missing out on … everything worthwhile in this world! But it’s a done deal. Christ’s death on the cross was the sacrament of His saving grace over you, whether you want it or not. He said, “I, if I am lifted up from the earth, will draw all peoples to Myself.” (John 12:32). All peoples — that includes you, like it or not. So grace is there, it is happening, and you’d be crazy not to accept it. But then you had another question. “Don’t I have to start living right to keep it?” No, and for the same reasons: the grace of God is a fact that we can’t negate, no matter what we do. In fact, a lot of the parables Jesus told seem to indicate that the only people who might, in fact, miss out on a joyful eternity with Him are the ones who insist that they can get there on their own good works without His freely given grace. So this would be the people who do start living right in order to “keep” His gift of grace! And who are the people who might do that? Not us losers! We know we are screw-ups! We know we can’t behave our way onto God’s good side. We know if we’re going to get there at all it’s going to be because of His total unmerited favor. BUT the people who are used to winning — used to getting the prize they deserve because of their own hard work and native strength and goodness — they’re the ones who might be tempted to put their faith in their own ability to live right rather than in God’s grace! Once again: we losers are out ahead of the game in this arena. It seems the most fatal thing you can do, once you have received God’s grace, is to assume that you have a part in keeping this grace working for you, and that your part is based on your good actions. You don’t, and it’s not. The Apostle Paul makes that clear in Ephesians 2:8-9, “For by grace you have been saved through faith, and that not of yourselves; it is the gift of God, not of works, lest anyone should boast.” It’s a gift, and a gift means: no strings attached. God’s love for you is unconditional, and His grace for you springs from that love. Still and all, wouldn’t it be nice if everyone who had received God’s grace started behaving right? Well, yes, of course, it would be great. It would be great if everyone — period — started behaving right. It would be lovely. We should all behave just the best that we can. But what we don’t want to do is start telling ourselves (or anyone else) that our behavior is what makes us God’s beloved. Or worse, that our behavior can place us outside of God’s love. That is a very vicious thing to tell someone! My poor old grand-dad was told by his Pentecostal Holiness church back in the day that smoking cigarettes was a sin, and sinners didn’t go to heaven, so despite his loving Jesus (and Jesus’ loving him!) he was going to hell unless he quit, which he couldn’t. My grandpa thought, to his dying day, that he was going to hell because he smoked. This is the pernicious end of the idea that our good behavior makes us more acceptable to God — or that our bad behavior makes us unacceptable to Him. So don’t believe, and don’t tell other people, that behavior has the power to get God’s grace or lose it. God’s grace is a free gift to you, no matter what you do or don’t do before you receive it or in response to it. God just loves you, no matter what.